MY TIME is hull #87 of the very successful Tartan 3700 line. This two-cabin performance cruiser designed by Tim Jackett features a hull shape for winning races and an interior for ultimate cruising comfort. First produced in 1999, the Tartan 3700 quickly became one of Tartan's most successful model lines with over 100 hulls coming off the factory line in Fairport Harbor, Ohio. The 3700 quickly won Cruising World's "Best Midsize Cruiser" Award in 2000 as well as making the list as one of "Top 5 Affordable Bluewater Cruising Sailboats." MY TIME features the classic Tartan interior with beautiful cherry woodwork and joinery down below, two spacious double cabins, a gourmet galley with tons of counter space and a spacious cockpit fit for entertaining guests or single-handing. Because the 3700 carries her 12'8'' beam aft, which allows for a spacious interior layout as well as a large cockpit. All of this luxury doesn't slow down the 3700's performance. 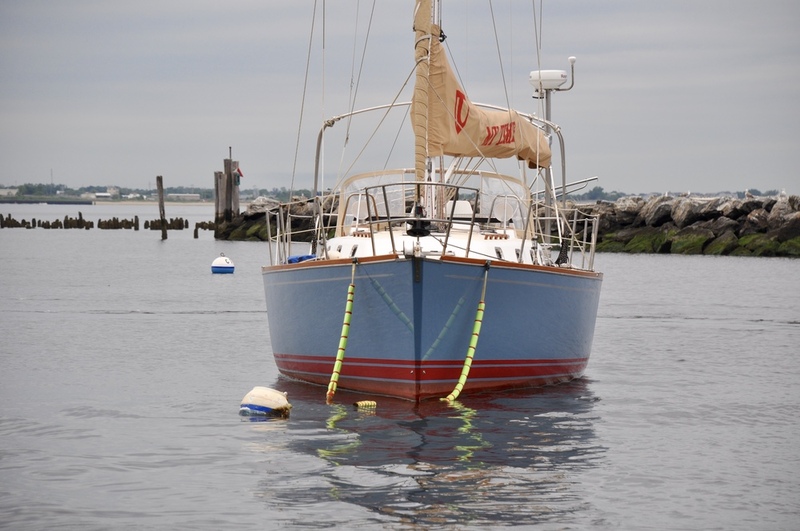 The hull shape and beavertail keel help MY TIME scoot, even in light wind. With a full host of Raymarine electronics including two Raymarine E80 chart plotters, MY TIME is set up for coastal cruising. You can easily set the autopilot and adjust your sails from the large primaries without ever leaving the helm. Face the facts…The cockpit is the life blood of any fine cruising yacht. This is where you spend 90% of your time while onboard. You need comfort, convenience, and easy access to all the yacht’s systems for smooth sailing. Tartan has mastered the sailing cockpit. The long benches are perfect for comfort when heeled on an athletic sailing day or napping under the stars on a warm summer night. The folding cockpit table is large and can support a full meal at anchor or snacks under way. Everything you need to sail the boat, single-handed or with crew, is right at your fingertips without leaving the helm. The Raymarine radar and chart plotter is centrally located in the Lewmar pedestal at the helm. The autopilot is right at the helm in a recessed storage area at the starboard coaming and the Yanmar engine panel lies below. With minor help from the autopilot, you barely have to leave the helm to sail this boat. The primary winches are right near the wheel and the halyard winches are easily accessible at the cabin top forward. Tartan builds a thoughtful yacht, from the bow all the way to the stern. Up forward, the headsail furler is close to the deck for performance sailing. The windlass that powers both up and down at the bow allows for easy anchoring. The large anchor locker will accommodate any chain/rode configuration you desire and also houses the deck wash down raw water system. The decks are wide and travel around the boat is easy and ‘toe-stub’ free. The sheets and halyards all lead back to the cockpit for easy single-handed sailing. The dodger and bimini are expansive and cover the entire cockpit easily. 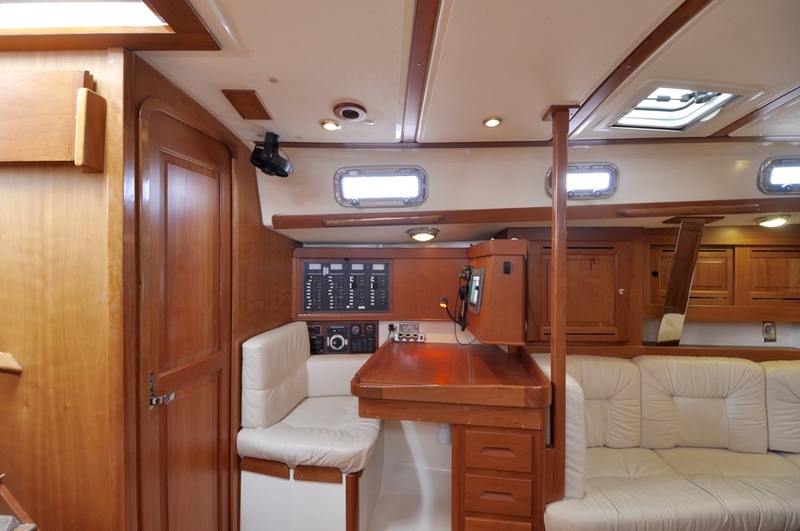 The wide cockpit makes for easy movement from the companionway to the stern and electric flip-down swim platform. The Tartan 3700 is set and ready for cruising with all of the running rigging leading aft to the cockpit for easy handling from the helm and cabin top. The Dutchman flaking main provides an easy system for deploying and putting the sail away. MY TIME also features cockpit-adjustable Harken jib cars and tracks for adjusting your headsail shape from the cockpit and a hydraulic backstay for enhanced performance. With the primaries close to the helm, single-handing is a breeze. Once away from the dock, set the autopilot into the wind, pull up the main (we pulled it ¾ of the way up by hand), head back to the helm and you’re all set for a fun day of cruising. Below decks you’ll find a warm, rich inviting space for lounging at the end of a cruising day. A gourmet galley lies to starboard, nav station to port, and a spacious main salon that takes advantage of MY TIME’s nearly 13’ beam completes the main living space. There’s a comfortable sitting area with a beautiful center-line drop leaf table. There is a large u-shaped settee to starboard that offers a great space for dining or for kicking and relaxing. The starboard settee also pulls out to make an extra double berth. There is a ton of natural light via numerous overhead and side hatches. The main salon is a warm and inviting space with comfortable settees kicking back and listening to the stereo after a day of sailing or setting up the large drop leaf table for a nice dinner. Tartan’s teak joinery and detail are evident throughout the cabinetry and ample storage with the warm wood interior. There is additional storage behind the settee seat backs. The large u-shaped settee to starboard offers comfortable seating as well as a sliding pullout filler to make an additional double berth. The straight 6’2’’ settee to port offers comfortable seating and lounge space as well. 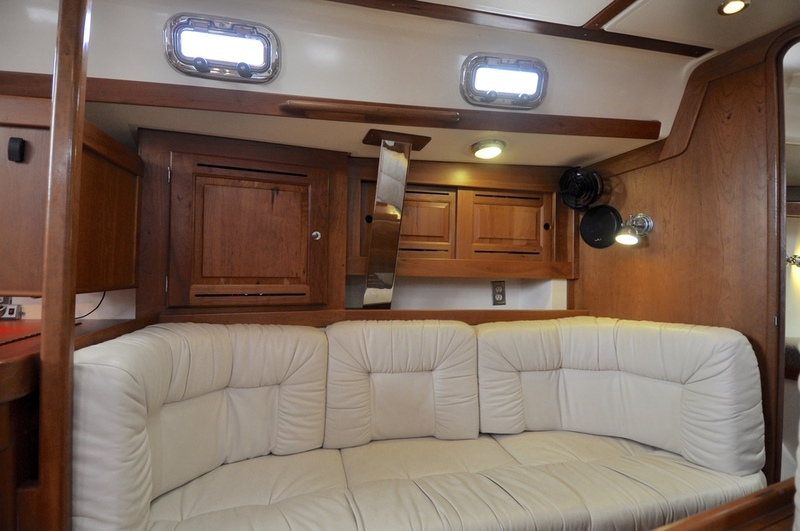 A large gourmet galley greets you to starboard with Corian countertops, front and top loading fridge/freezer, stainless steel double sink, 3-burner stove/oven, microwave, and lots of storage for long cruises. Chefs always demand counter space on either side of the sink and cooktop and MY TIME delivers. The Tartan 3700 features an added fold-up countertop to the right of the sink for added counter space. There are plenty of deep storage lockers and lots of refrigerator space. There is even a designated pullout cabinet for trash. This galley just works! The large forward-facing navigation station features a three foot wide chart table with a Raymarine E80 chart plotter. A red Hella light allows for charting at night and the large chart table provides a great space for navigation or a home office. The 12V and 120V electric panel lies to port as well as a battery monitor panel, a Spectrum VHF, and great additional storage with four pullout drawers forward and a large storage compartment below the Nav station seat. Forward of the salon, the V-berth cabin features a large double bed that very comfortably sleeps two. 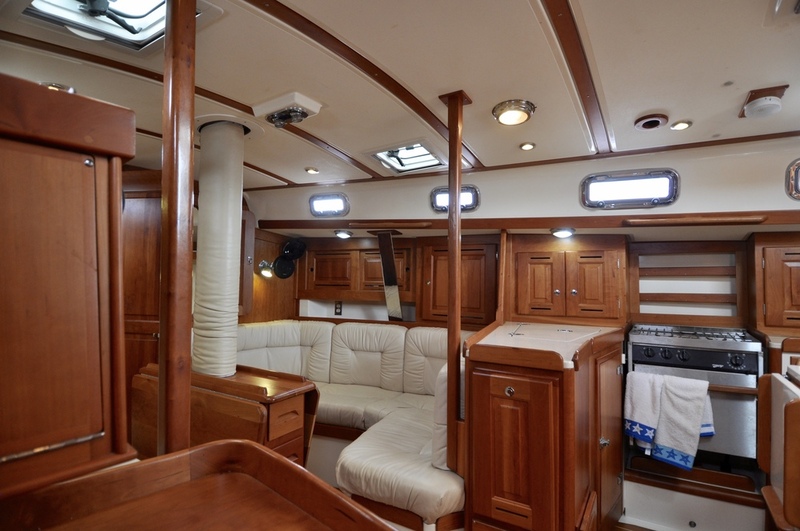 With two large overhead hatches and two side ports, there is a ton of natural light and a great breeze while anchored. A private vanity and sink lies to starboard and a large hanging locker is to port. There are also large pullout drawers below the berth for additional storage. The berth has a removable center V that allows you to make two single berths. Tartan puts a lot of design thought into their layout, and the head is no exception. 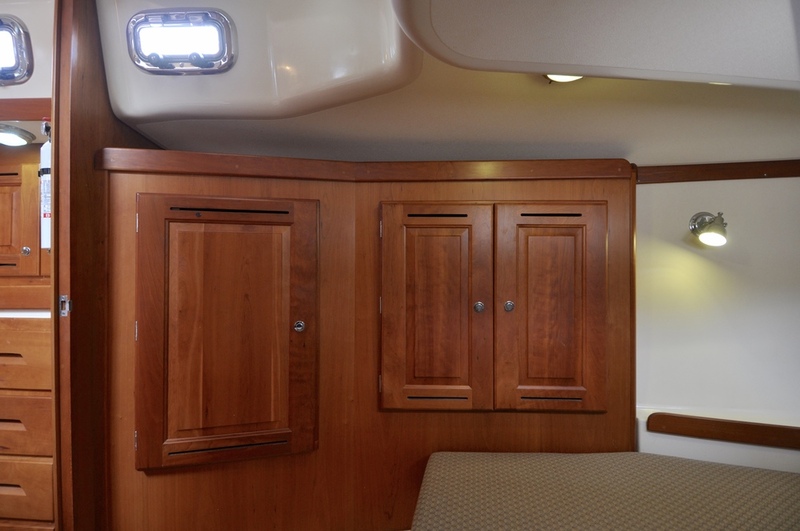 The 3700 features a very well laid out head to the port of the companionway hatch. With a designated shower space, comfortable L-shaped seating and a plexi-glass divide, there is plenty of room for showering. The head also offers a ton of storage with cabinets below and above the composite countertops and vanity sink. The 40hp Yanmar is in good condition and is easily accessible for maintenance. you can easily swing up the companionway steps for easy access to the front of the engine or you can remove the spring loaded back cover in the aft companion for easy access to the back and shaft. When we travel with clients FAR out of town for yachts, we don’t like surprises when we get there. It’s embarrassing for us and can make for an expensive trip. With that in mind, we’d like to share our rating of the various systems on the boat so you’ll be as informed as possible before you come for a visit. Our rating system is on a 1-10 scale with 10 being ‘excellent’ (in OUR opinion). Please view this list as a GUIDE only. Everyone’s idea of good and bad can vary quite a bit. Our goal in doing this is to help you reach a comfort level with the boat before you invest time and energy to come and see it. We’ll summarize by saying that this IS a well preserved twelve year old yacht worthy of your serious consideration. This is a performance cruising boat, well cared for by her owner. Step below though and she's a posh cruising yacht everywhere you look. We seriously spent quite a while looking for blemishes. The teak and upholstery are in good shape. The cockpit layout makes for easy single-handing with the primaries within easy reach of the helm. All ship’s systems appear to be in excellent working order. MY TIME is rigged for weekend racing if you feel the need for speed. Her 5'-0" draft allows for deeper exploration into the backs of inlets and protected anchorages in the islands. Her plumb bow and slippery hull shape keeps her in the 7-9 knot speed range under most sailing conditions 12 knots of wind and higher. MY TIME has seen some wear from the salty air and does need some cleaning of her exterior stainless steel, but a polish can bring it back. If your desire is to head off on long distance off shore cruising, there's very little you would need to do to this yacht. Some more battery power, some sort of power generator (wind, water, or solar) and some off shore safety gear is all you would need. She's a serious vessel built for serious voyaging. The hull and decks show well and the custom design with the aluminum toe rail makes for easy deck maintenance. The decks are wide for easy passage and the cockpit is in great shape. The owner focused on improving even the smallest details like moving the engine start key up to the side storage in the cockpit coaming so it would not get bumped while under way. All sunbrella canvas is in good shape and spends a good portion of its life in storage. The hull was repainted Stars and Stripes Blue in 2014. The exterior stainless steel has weathered some from the salty air and needs a polishing. Polished stainless steel will bring the exterior up to a solid 9/10. Everything on the boat seems to be in good working order. She's ready to go with great electronics including two Raymarine E80 chart plotters, one at the helm and one at the nav station, and Raymarine ST60 depth, wind and speed above decks. The autopilot makes for easy single-handing and is conveniently located right at the helm. If you wanted to take the electronics package to a full 10/10, you could add in send/receive AIS for long range cruising. 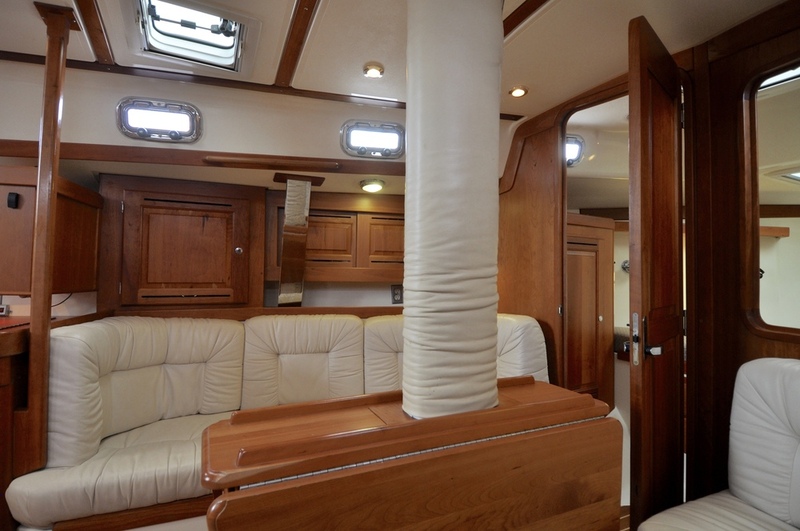 This yacht has only seen light use so the interior shows extremely well. She's very classy looking with deep rich teak hues in the woodwork, plush ultra-leather upholstery and a cabin sole in superb shape. The opening and fixed ports throughout the boat bring in tons of air and natural light underway or at anchor. The galley is extremely spacious with a ton of countertop space and the two double berth cabins are equally appealing as an owner’s suite. There is a ton of storage aboard with large hanging lockers, deep cabinetry, and exterior storage lockers. Regular oil changes and a easily accessible from the companionway steps or from the aft cabin. Hoses look good. Hardly any corrosion on engine or mounts. Maintenance on the engine, transmission and drive unit is easy. The hour meter isn’t functioning, but the Yanmar has been VERY lightly used. The owner estimates that about 900 hours have been put on the engine. The 3-blade MaxProp adds additional efficiency. The running rigging is in good shape and the Dutchman flaking system for the main makes for easy stowage. The sails are in good shape as well. The 105% genoa is in great shape. The large main on the tall (56') rig has two super deep reef points controllable from the cockpit for big wind conditions. The large primaries make for easy sail handling and the running rigging all leads aft to the cockpit.